The Bahamas have some of the best snorkeling and scuba diving in the world. With its underwater beauty, a trip there can be a memorable experience. For the visiting diver, one option is to hiring a dive guide to explorer the ocean floor. For those who would rather stay closer to the surface, you have the option of booking an organized snorkeling tour. Lastly, you have the option of snorkeling close to a beach of your choice. The Abacos is a string of Islands and cays, which have some of the best beaches in the Bahamas. This location is know for its excellent snorkeling. Some points of interest include: Elbow Cay, Mermaid Beach and Marsh Harbor. Because of its abundant marine life and the east coast barrier reef, Andros is popular among divers. In addition, the Barge Wreck is a popular attraction worth exploring. Known for it beautiful secluded beaches, Eleuthera is a popular destination for snorkeling in Bahama Islands. Also, Eleuthera has various underwater shipwrecks, including a submerged locomotive that sank in the 1800’s. This destination is known for its abundance of dive spots. With its beautiful coral reefs & destinations such as The caves, Theo’s Wreck and Treasure Reef, you are sure to find something you will enjoy in Grand Bahama. Known for its miles of unspoiled beaches, San Salvador is good for swimming, shelling, and of course snorkeling. Some points of interest include Long Bay and Bamboo Point; both located a few miles away from Cockburn town. Other popular snorkeling destinations here include Grotto bay and Sandy Point. With its shallow bays, Long Island offers many options for snorkeling in Bahama Islands. Points of interest to a snorkeler include: the east side of the island and southern area. These areas are known for their sea cliffs. The waters in the area of Paradise Island and New Providence has the makings of a great aquatic adventure. Popular locations for snorkelers includes Gambler Deep Reef, Rose Island, and the Goulding Reef Cays. Other points of interest include underwater shipwrecks near the coast. 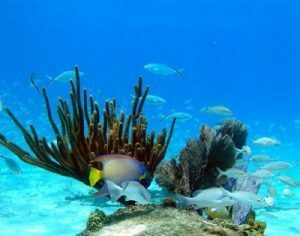 What ever site you decide to visit, you will find great snorkeling in Bahama Islands.